A Labradoodle is a hybrid dog breed also known as “designer Dog”. A Labradoodle is a mix between a Labrador retriever and a poodle. The Labradoodle was originally breed and developed in Australia to be a hypoallergenic guide dog; there were only a few people in charge of breeding these dogs. So not only did people like that they were guide dogs but they liked that the dog could be a versatile family and therapy dog as well. They have become popular quickly, and their popularity is still growing! The Labradoodle quickly rose in popularity and has become one of the most desired Doodle breeds out there. They make excellent family dogs and provide gentle and intelligent companionship throughout their lifetime and yours. Dogs come in all different shapes and sizes from the small to the very big! The Labradoodle comes in three size variations witch all depend on the size of the Poodle used for the first-generation breeding. The three sizes are Miniature, Standard, and Medium. The average size for a Miniature Labradoodle is between 14 to 16 inches and 15 to 25 pounds. This is usually the result of a toy poodle mixed with a Labrador. The Standard Labradoodle should be 22 to 24 inches in height for a male and 21 to 23 inches in height for a female. Male and female can both can range in weight from 50 to 65 pounds. The Medium Labradoodle should be 18 to 20 inches high for a male and 17 to 19 inches high for a female. Male and female can both range in weight weighing from 30 to 45 pounds. The Labradoodle is an intelligent dog who can make the best family companion if properly trained! A Labradoodle is devoted to her family and enjoys life! They are beyond friendly and treats everyone like their best friend. Not only will your Labradoodle be affectionate with your family and kids, but they will also get along with other dogs and animals such as cats, birds, and farm animals. They also tend to be easygoing, since the Labradoodle was bred not to be aggressive animal. This is truly the case with any breed, but some poorly bred ones aren’t all that friendly; a well-bred Labradoodle with a great personality is pure true joy. Temperament is affected by a number of factors, including heredity, training, and socialization. Puppies with nice temperaments are curious and playful they will also want to be held by them. Socialization helps ensure that your puppy grows up to be a well-rounded adult dog! Like every dog, the Labradoodle needs early socialization this means early exposure to many different people, sights, sounds, and experiences at a young puppy age. inviting visitors over regularly, and taking the dog to busy parks, stores that allow dogs, and on leisurely strolls to meet neighbors will also help to improve your puppy’s social skills. Overall the Labradoodle is a very affectionate, loveable, and caring dog towards family members and other dogs. The Hair coat, which is similar to fur which are mostly in shedding breeds. Hair coats shed easily and usually have a normal doggy odor. 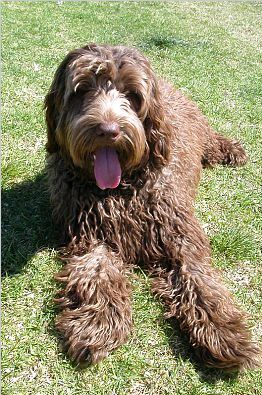 This coat is seen in first generation Labradoodles and breeders try to avoid it because it is very un-popular. The wool coat is dense and similar in feel to a lamb’s wool which in hence its descriptive name. This coat usually hangs in loose curls and aren’t dense. The Wool coat doesn’t have an odor and it usually doesn’t shed. The Fleece coat has a silky texture! This coat ranges from straight to wavy. The Labradoodle comes in a wide variety of colors. They can be gold, apricot, caramel, black, red, cream, silver, chocolate, and blue! Grooming requirements vary depending on the length and type of coat your Labradoodle has. Generally you can expect to brush a Labradoodle about once or twice per week! Some can be clipped or trimmed every six to eight weeks to keep the coat easy to maintain. A Labradoodle should only be bathed when necessary; many of the coats don’t have a noticeable doggy odor. Like the Lab, the Labradoodles can be prone to ear infections so you should try to clean their ears often! Brush your Labradoodle’s teeth at least two or three times a week to remove tartar buildup and the bacteria that lurk inside it. Daily brushing is even better if you want to prevent gum disease and bad breath. Trim nails once or twice a month; if you can hear them clicking on the floor, they’re too long and it’s time to trim them. Start grooming your dog as a puppy so they can get accustomed to it. Make sure you make the experience as positive as possible for them with lots of praise afterward. If your dog has a bad experience with grooming that’s it from there on out they will hate it. As you groom, check for sores, rashes, or signs of infection such as redness, tenderness, or inflammation on the skin, in the nose, mouth, and eyes, and on the feet. Eyes should be clear, with no redness or discharge. Labradoodles are generally healthy, but like all breeds they can be prone to certain health conditions. Not all Labradoodles will get any of these health problems but it’s good to be aware of them. In no way are we saying your dog has this or will have these. If you’re buying a puppy, find a good breeder who will show you the health clearances for both your puppy’s parents. Health clearances prove that a dog has been tested for certain diseases. Hip Dysplasia: this is an inherited condition where the thighbone doesn’t fit snugly into the hip bone. You will notice this on the health clearances from your breeder. Allergies: Allergies are a common ailment in dogs, and the Labradoodle is no exception. There are three types of allergies food, contact, and inhalant allergies. Treatment varies according to the cause and may include dietary restrictions, medications, and environmental changes. Ear Infections: this can be a problem for Labradoodle due to their floppy ears. Make sure you keep their ears clean and check in them often. Epilepsy: This is a neurological condition that often, but not always, inherited. It can cause mild or severe seizures. Seizures are super scary to watch; the long-term prognosis for dogs with epilepsy is generally very good. It’s important to take your dog to the vet for check-ups for proper diagnosis. Diabetes Mellitus: This is a disorder in which the body cannot regulate blood sugar levels. A diabetic dog will eat more food to try to fix the fact that glucose isn’t getting into their cells. Symptoms of diabetes are excessive urination and thirst, increased appetite, and weight loss. They require about 30 to 60 minutes of exercise per day and would do better with a fenced yard in which to expel some energy rather than a condo. Some Labradoodles can require even more exercise because both the Lab and Poodle are very athletic dogs. The Labradoodle makes an excellent jogging companion but also needs some time off-leash to burn off steam and to run free. If the dog becomes bored it can become a destruction machine! Training should be easy as long as positive reinforcement are the methods. She can make a good companion for first-time dog owners since she doesn’t need an overly firm hand. The Labradoodle is a very highly intelligent breed and when training him they will pick up cues and moves easily. Obedience training and interactive dog toys are good ways to give a dog a brain workout. Crate training benefits every dog and is a kind way to ensure that your Labradoodle doesn’t have accidents in the house or get into things they shouldn’t. Crate training at a young age will help your Labradoodle in training and they will learn how to handle being boarded. Never stick your Labradoodle in a crate all day long! How much your adult dog eats depends on his size, age, build, metabolism, and activity level. Dogs are individuals, just like people, and they don’t all need the same amount of food. The quality of your dog food also makes a big difference. The better the food the more nourishment it will give your dog. Keep your Labradoodle in good shape by measuring her food and feeding her twice a day rather than leaving food out all the time. Recommended daily amount: 1 to 2.5 cups of high-quality dry food a day, divided into two meals. Dividing your Labradoodle’s food into two or more meals per day instead of a big bowl once a day can also lower her risk of gastric torsion, also known as bloat. The Labrador retriever can suffer from this condition, and it’s a trait that can be easily passed on to any Labradoodle offspring.